Pizza at brunch – what could be better? 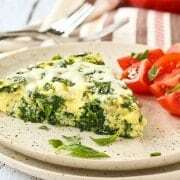 This white pizza frittata has all the flavors of pizza that you love in an irresistible and filling baked egg frittata. Brunch perfection! Anyone besides me already planning Mother’s Day brunch menus? 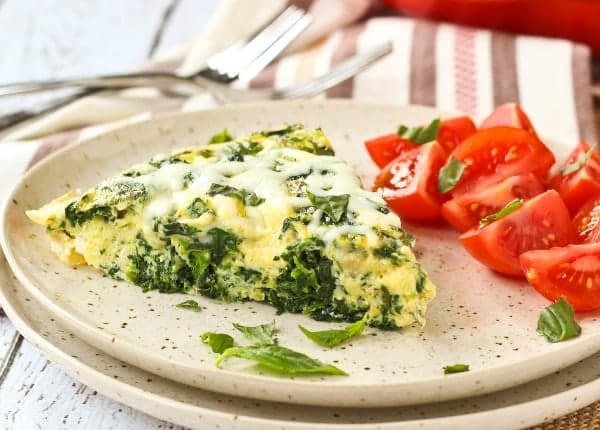 It’s super early, I know, but I’m obsessed with brunch food and this white pizza frittata recipe is perfect for the vegetarians at your table. It’s not, however, perfect for vegans. Obviously. You know, because of the eggs and three types of cheese. How do vegans do it? I could never survive without eggs and cheese. You can keep your cashew “cream” sauces and nutritional yeast “cheese,” I’ll take the real thing. Plus, eggs! How does one live without eggs? You can’t scramble a flax egg and eat it for breakfast. I’m not knocking anyone’s dietary choices, I just COULD NOT DO IT. 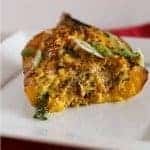 I love making frittatas of all types like an asparagus leek frittata or this sweet potato and spinach egg bake (can we call that one a frittata?) and this white pizza frittata is especially fun. 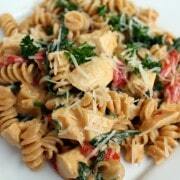 It’s ultra flavorful thanks to garlic, oregano and fresh basil. It’s super filling thanks to the eggs and three types of cheese (Mozzarella, Ricotta, and Parmesan). The spinach gives you a boost of greens that will keep you energized throughout the whole morning and maybe even into the afternoon! 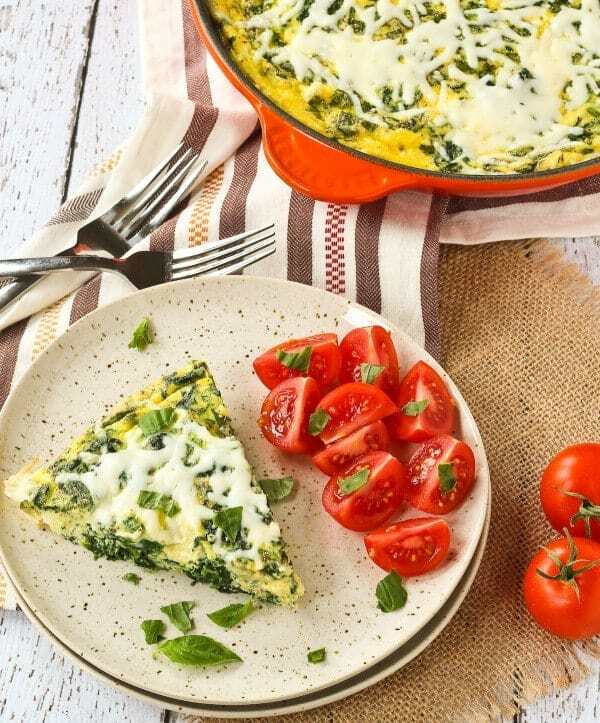 This white pizza frittata will blow everyone away at any brunch you host this year. If you’re looking to round out brunch, try pairing this with a pear hibiscus brunch cocktail, a pretty salad, some bacon (duh), and a gorgeous fruit salad. Cookie bars for dessert, maybe? In an oven-safe skillet, heat olive oil over medium heat. Add garlic and cook for 2 minutes or until fragrant. Once garlic is fragrant, add spinach and break up to incorporate and heat. Meanwhile, in a medium bowl, whisk together eggs, milk pepper, oregano, ricotta, parmesan, and basil. Add egg mixture to skillet, reduce heat to low, and cook for 1 minute, stirring gently. Move to preheated oven and bake for 25-30 minutes or until eggs are almost completely set. Verdict: Delicious! I love the flavors of the white pizza – garlic, oregano, fresh basil and of course all the cheese! Husband’s take: He’s not a garlic fan – when I make this white pizza frittata again, I’ll cut back on the garlic for him. Disclosure: I am thrilled to be a dairy ambassador for Milk Means More. I have been compensated by Milk Means More for my time to develop this recipe and write this post. All opinions are as always, my own. Find out more about why Milk Means More on Twitter, Facebook, YouTube, Instagram and Pinterest. 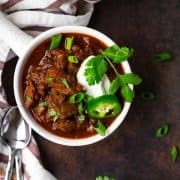 I saw this recipe in a video in my facebook feed, but can’t seem to find the video here. Hi Judie – what browser are you using? Are you on a phone, tablet, or computer? It’s showing up for me. Let me know if you’re still having problems! This looks awesome! Any suggestions for how I might make it without an oven-safe skillet? Unfortunately, I don’t think that will work. 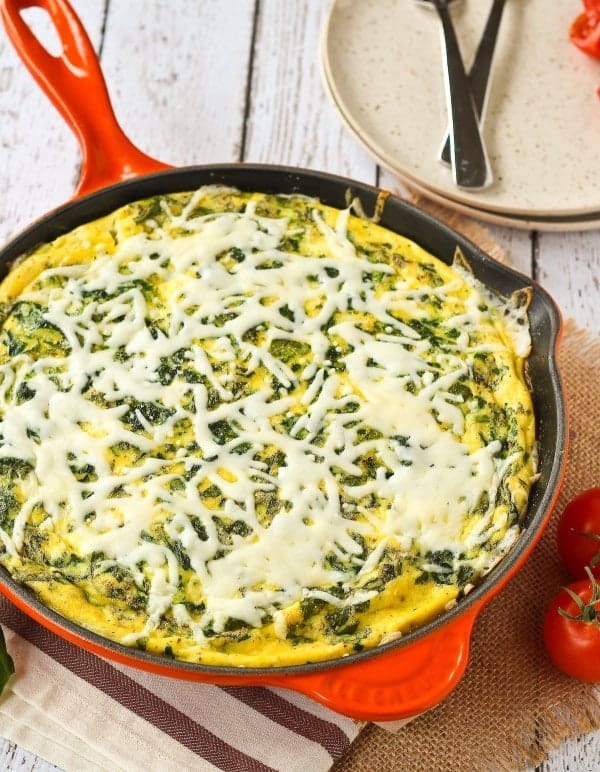 A frittata really needs the stove-to-oven process to be a frittata. This looks fabulous! I love white pizza so taking all that falvor and packing it into a frittata is genious! Also I can’t belive Ben doens’t LOVE garlic. It’s so good! I’m with you. I’d be lost without my eggs and cheese! Great frittata, Rachel. Pizza is a breakfast, lunch, and dinner meal at our house! The more excuses I have to eat pizza for breakfast, the better. I can’t wait to whip this up for weekend brunch! Oh girl, I am so with you. I always say that eggs are the reason why I couldn’t stay a vegan! This looks amazing and I can’t wait to make it! Totally agree … I just could NOT do it! I want the real thing. Eggs come from chickens, not from plants. Now that’s not to say that intelligent choices shouldn’t be made — I love me a big-volume omelette, but will happily sub some egg whites in there. But I’m going to cook it with butter, not coconut oil. This recipe looks good enough to eat right from my screen. Thanks. Pizza upon waking?! THIS IS AMAZING. I love frittatas and I LOVE pizza, so putting the 2 together is a work of art. I bet this would even be DELISH for dinner! Pinned! Thanks Christine! :) Pizza always gets my attention, ha! This sounds wonderful!! Such a good meal for breakfast or dessert!